MUNSTER’S largest shopping destination, the Crescent Shopping Centre in Limerick, has undergone extensive refurbishment in the last two years to offer shoppers an outstanding experience. With anchor tenants like Tesco, Penneys, Shaws Department Store, Argos and Boots, international brands like Selected Femme / Homme, Superdry, Gap Outlet, Swarovski, Pandora, Irish independent brands like Inglot, Pamela Scott, Carraig Donn, Elverys, Easons, and more, there’s something for everyone at the Crescent. With a range of services including hairdressers, beauty salons, a locksmith, banks, ATMs, a post office, a travel agent, and a 12 screen Omniplex cinema, there is truly something for everyone. Parents can keep kids entertained in our outdoor playground, or take a well-deserved shopping or coffee break while letting the qualified staff in our drop-in crèche look after your little ones! Pop into Butler’s Chocolate Café, BBs Coffee and Muffins, Costa Coffee, or enjoy delicious food offerings from O’Brien’s Sandwich Bar, Quigleys, Milano, Ramen & Sorrento, Subway, KFC, Shake Dog, Franklin’s Restaurant and McDonalds. And that’s not all! The latest addition to the centre is the weekly Farmers Market which takes place every Friday from 10am – 4pm, located in the Civic Area, just outside the City Mall entrance near the newly opened Milano restaurant. With all of this, and an emphasis on value, comfort and choice, the Crescent Shopping Centre is well worth a visit. Opening hours are Monday-Wednesday and Saturday 9.30am-6pm, Thursday and Friday, 9.30am-9pm and Sunday 12 noon-6pm. For more, see Crescent Shopping Centre. 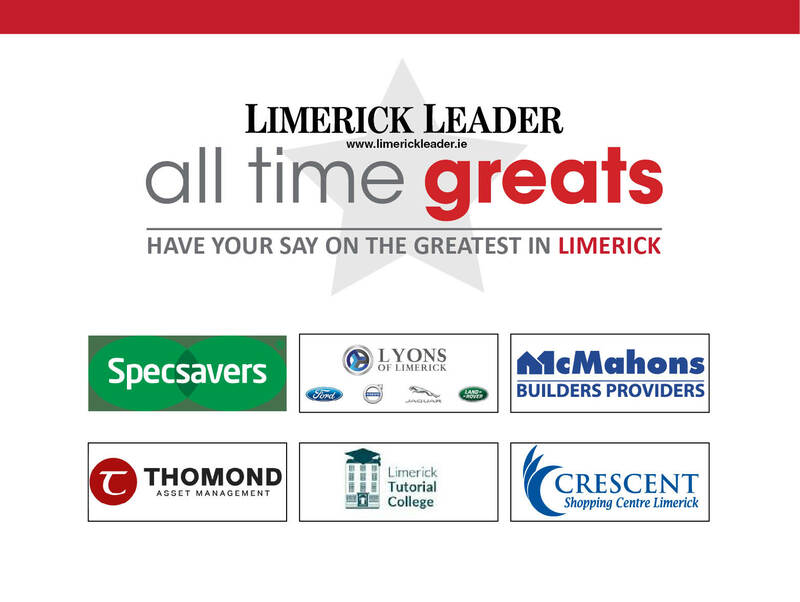 The Crescent is backing the Limerick Leader’s search to find Limerick’s All Time Great.